Growing up, Sis and I were probably considered luckier than most kids. You see, when Mom went grocery shopping and bought cereal, she always allowed my sister and I to each choose one box of the "good" cereal. You know, like Froot Loops, Lucky Charms, Franken-Berry, Count Chocula, or the mouth-shreddingly good, Cap'n Crunch. Even today, my sister is a total and complete cereal addict. To this day, she will happily have a bowl of cereal at any time of day - even for dinner if she doesn't feel like cooking. As for me - sure I like cereal just fine, but I was always fascinated by the kids on the TV commercials who got to have Nutella for breakfast. I mean c'mon! It's chocolate on bread! For breakfast! How awesome is that?!? To this day they still market it as "...part of a tasty balanced breakfast", yet Mom seemed to draw the line at Cap'n Crunch. It would be many years later before I finally had my first taste of Nutella, and it was well worth the wait. Now that I am all grown up, I can have Nutella for breakfast any time I want to (though I usually have some yogurt and a really good cup of coffee), but it still feels more like a dessert spread to me than breakfast food. For this month's Nutella Challenge, hosted by Paula at bell'alimento, however, I am bringing this hazelnut-chocolate spread back to the breakfast table with Nutella Biscotti. 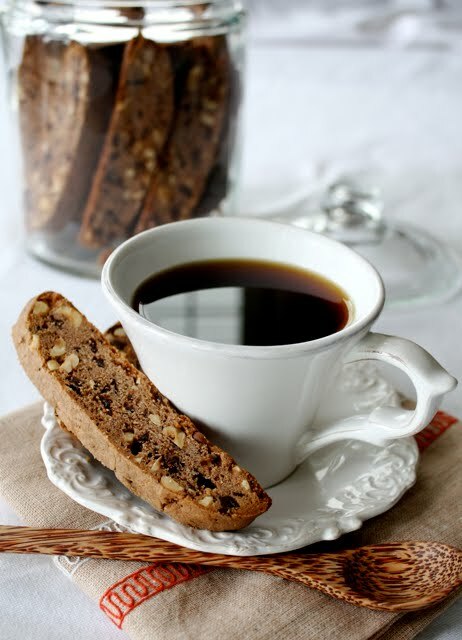 Technically, biscotti is a cookie and not breakfast, but it is meant to be served with coffee, and that first cup of the day is always my favourite. I found this recipe in a new cookbook I recently picked up: The Art & Soul of Baking by Cindy Mushet for Sur la Table - this book has recently picked up an IACP Award and was nominated for a James Beard Award. Cindy's book is filled with a tonne of fantastic recipes, lots of step-by-step photos for different techniques, plus most recipes also have little sidebars of tips and tricks titled "what the pros know" and "getting ahead" tips for making recipes in advance. One of the things that drew me to the recipe, aside from the use of Nutella, is that she describes these twice-baked Italian biscuits as having a slightly softer texture than traditional biscotti. I love that idea, as so often biscotti can be rock hard when dry, only to crumble and break off when you dunk them in your coffee - and that ain't a pretty thing to find in the bottom of your cup. These turned out perfect in my opinion: a nice firm, crunchy texture, but they completely hold together when you dunk them. Delicious. One change I did make to this recipe was that I used Lindt's Fleur de Sel Chocolate in place of just regular bittersweet chocolate. Mostly because I love the depth of flavour that the sea salt brings to Lindt's silky, rich chocolate, and I thought it would be a nice addition in these cookies, and I was very pleased with the results. Cindy also says you can substitute any type of nuts you want in this recipe, but since I was making her Nutella variation, I decided to stick with the classic hazelnut. In the bowl of a stand mixer fitted with a paddle attachment (or in a medium bowl with a handheld mixer), cream together the butter and sugar until light and fluffy. Add the Nutella and mix until fully combined. With the mixer on medium-low speed, add the eggs, one at a time, until well blended, scraping down the sides of the bowl after each addition. In a medium bowl, whisk together flour, baking powder and salt. Add the dry ingredients to the wet mixture all at once, and mix on low speed until there are no more patches of flour visible. Add the chopped hazelnuts and chocolate, and mix on low until incorporated. Remove the bowl from the mixer and mix the dough by hand, using a rubber spatula, to evenly distribute the nuts and chocolate. Divide the dough in half, and turn out onto a lightly floured surface. Gently squeeze and roll the dough into a log about 13 inches long. Transfer to a parchment lined cookie sheet, and gently press down and flatten the rolls until they are about 2 inches across on the top. Repeat with the second half of the dough, allowing 4 inches of space between the logs. Bake for 30-35 minutes, until the logs are firm to the touch and lightly golden brown. Transfer logs to a cooling rack and allow to cool completely (if you slice the cookies while they are still warm, the chocolate will smear and you'll have ugly biscotti). Reduce oven temperature to 275˚F, and position 2 racks in the oven, dividing the oven into thirds. Once the logs have completely cooled, using a sharp, serrated knife, slice the logs on a slight diagonal into individual cookies about 3/8 thick (I sliced mine much thicker). Place the sliced biscotti, cut side down, onto two parchment lined cookie sheets and place them back in the oven for another 30-40 minutes, rotating the cookie sheets about halfway through. The biscotti should be dry and lightly golden brown. These cookies will keep in an airtight container, at room temperature, for up to 2 months... that's assuming they don't all get eaten right away. Wow! I am stunne! I love making biscotti and we love eating biscotti and this recipe is now on my MUST bake list! Fabulous! 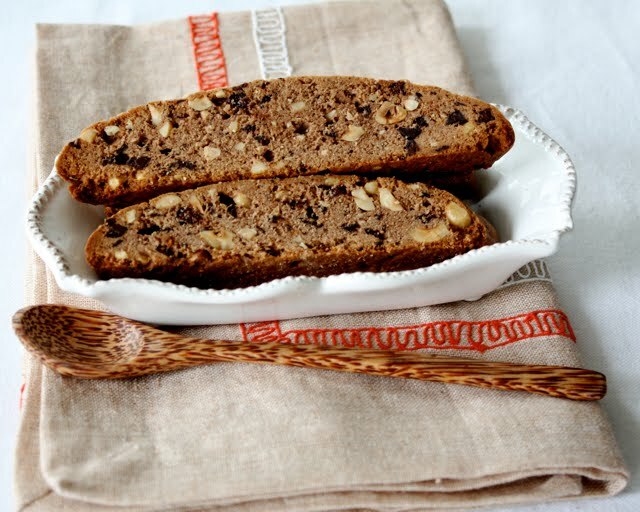 Great recipe and perfect looking biscotti! 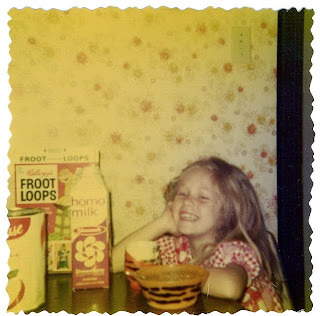 And ditto for us on the cereal front when we were kids - and you listed all of our favorites! (love the pic LOL) But I didn't even know Nutella existed until a trip to Israel when I was 17! Wow what a revelation. But alas, it wasn't sold in Florida. Great memories... thanks. WOW I am still speechless about the wonderful biscotti creation... loving the nutella and your photos are amazing!!!! I am the QUEEN of biscotti baking and I think I must try out this recipe FOR SURE! A former floral designer - turned executive assistant, my real passion is baking. The endless variety of treats you can create, simply by combining butter, flour, sugar, eggs, cream, chocolate... YUM!! But for me it has to be the real thing; REAL butter, REAL cream, REAL vanilla and REALLY REALLY good quality chocolate. No substitutions please! All original recipes, stories and photographs on this site are the sole property of Julia House for Always Leave Room for Dessert and may not be used or reproduced without express written consent.